There have been plenty of upgrades to the Spider-Man franchise lately: Andrew Garfield has replaced Tobey Maguire in the 2012 movie reboot, "The Amazing Spider-Man." Over in the comic book world, the change to the Spider-Man character has been rocking the Web. 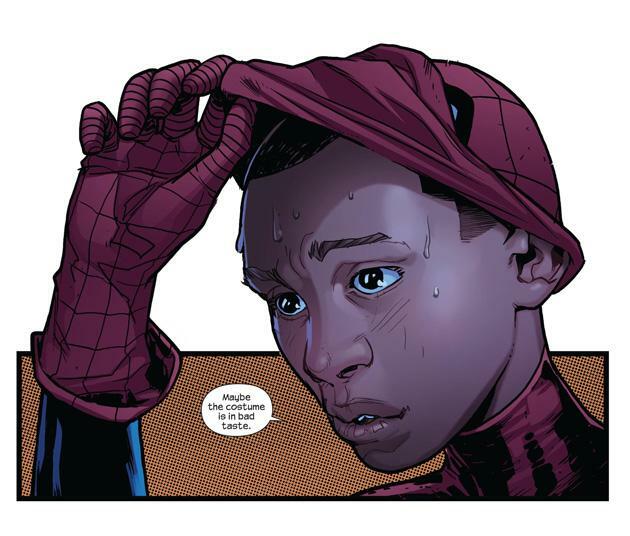 Meet Miles Morales, the half-black, half-Latino teenager who takes over when (spoiler alert!) Peter Parker is killed. Before anyone gets too upset, keep in mind that, first, the September relaunch of "Ultimate Spider-Man" is an alternate universe from the Marvel comic book series in which the original Peter Parker is alive and well. Second, these characters are just that -- not real. But try and tell that to the blogosphere. News of the new, ethnic Spider-Man rocked the Web. Searches spiraled upward in just one day on "new black spiderman," "miles morales," and this mouthful: "miles morales the multicultural spiderman." Opinion was fast and furious. Some dismissed the new superhero as "politically correct." (And that's one of the more printable comments.) On the Marvel site, comments were mixed. One complained, "This is not Spider-Man. Only Peter Parker is Spider-Man. R.I.P. Spidey." Another wanted to know, "Why couldnt he be Asian, there are plenty of blacks in comics already." One sent this approving message, "Way to go Marvel for blazing the way!!!! God bless America and Spiderman ... a true American hero!!!" Sports fans have been talking up the link between the new Spidey and Tiger Woods. Other commenters suggested a connection with a young President Obama. Even the fake-conservative news host Stephen Colbert jumped into the fray, joking that the the nonwhite character was stealing Peter Parker's job. Over at USA Today, a commenter defended the new Spidey: "I for one am glad to see this ... whatever way we can express equality, fine." Alexandra Petri, in the Washington Post, opined that "[t]he response to the black Spiderman shows why we need one." The creator of Miles Morales is one Brian Michael Bendis, who was inspired to develop a biracial character when he heard "Community" actor Donald Glover was campaigning for the movie role of Spider-Man. He thought, "Oh, I would so like to read that book." And then remembered that he could -- if he wrote it. The writer added, "Even though there's some amazing African American and minority characters bouncing around in all the superhero universes, it's still crazy lopsided." It seems the time for Miles Morales has come.